GTBL-420P –BRAZIL - GT TOURS INC.
Meeting, assistance and private transfer to hotel. En route, our guides will give some basic briefs about the city and their respective hotel. Rest of day at leisure. Half day city tour and Sugar Loaf & a welcoming caipirinha toast on top of Urca Hill. Buffet breakfast. The journey to the top is made in glass cable-cars. The first cable-car takes passengers to the top of Urca Hill, which rises 215 meters above sea level. On this first stage, you will have time to admire spectacular views of the entire bay and its surrounding islands sipping a resfreshing caipirinha, our special treat to welcome you to the Wonderful City! Before returning to the hotel, we will go on a panoramic tour by downtown area, stopping by the Municipal Theater and the Cathedral for a glance of the most well kept secrets of Old Rio. Rest of the day at leisure. Buffet Breakfast . Day at leisure to continue discovering Rio on your own or relax on the beaches. Afternoon visit to the Brazilian side of the falls. Buffet breakfast. Private transfer out from hotel to airport to catch a short flight to Iguassu Falls. Transfer in from Brazilian airport to the selected hotel. En route, our guide will give some basic briefs about the city and their respective hotel. The trip begins at the Iguaçu National Park with a drive through the lush subtropical vegetation of the park en route to the falls. Take a stroll on the trail that descends down the canyon, to offer panoramic views of more than 240 falls. Embark on the glass elevator up the cliff face for an exquisite view from the upper deck. The Iguassu National Park along with its “sister” park in Argentina form the most significant remaining rainforest in the southern cone of South America which along with the waterfalls, have been declared a National Heritage Site by UNESCO. We will end the tour with a visit to the artisans fair. Buffet Breakfast. Morning visit to the Argentinean side of the falls. We will cross the Tancredo Neves Bridge heading towards the Iguaçu National Park in Argentina. At the entrance, a small train takes visitors on a tour through the park, making 2 stops. Follow the pathways to the top of the waterfalls that provide spectacularly unique views of the ‘Cataratas’, amidst the abundant nature filled with orchids, colorful birds and other wildlife. The highlight of the tour is a visit to the suspended platform at the very brink of the ‘Garganta do Diabo’ waterfall (Devil’s Throat) – the largest fall in the park. Buffet Breakfast. Transfer out from hotel to the airport to catch your flight to Salvador. Private transfer in from airport to your selected hotel. En route, our guides will give some basic briefs about the city and their respective hotel. Buffet Breakfast. The Lower City tour offers another perspective of the sprawling city taking us to the quiet waters of the Itapagipe Peninsula where life moves at a slower pace than the bustling upper city. Fishermen fish from dug out canoes, locals collect shellfish at low tide, schooners lie at anchor, all protected by the famous Bonfim church, one of the most important churches of pilgrimage in Brazil and deeply syncretised with the Candomblé. (visit). We continue to the Monserrat district with its panoramic view of the city and on to the Mercado Modelo, a thriving market for local goods and souvenirs. This is also where you can test your bargaining talents! This tour is a complement to the Historical city tour. Please note that the Church of Bonfim is closed on Mondays. Stop for Acarajé tasting. During the tour we will stop at a well-known food stand to taste one of the most famous Bahian street food the Acaraje: deep fried rolls prepared with shrimp, black-eyed peas, red chilli pepper, onion and garlic. Buffet Breakfast. Private transfer out from hotel to the airport for your return flight home or to your next destination. Hotel accommodations in Rio de Janeiro, Iguazu Falls and Salvador at selected hotels . Hotel service charges and taxes. Daily buffet breakfast. All tours and excursions indicated in the itinerary fully escorted by English speaking guides. All airport transfers listed in the itinerary on private basis. Baggage handling at airports and at hotels. All entrance fees and transfers needed to operate tours and excursions. All meals indicated in the itinerary. 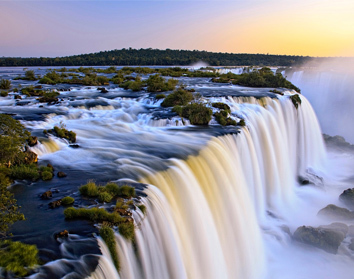 Round trip air international air between USA and Rio de Janeiro, Iguazu Falls & Salvador to be quoted separately on request. Fuel surcharges and taxes subject to change. Expenses such us beverages on meals, tips, laundry, phone calls and other personal expenses are not included. Passport and visa and reciprocity fees expenses.